This book is a richly illustrated and detailed analysis of the style of not just seaside buildings, but the whole seaside environment. Fred Gray describes the evolution of the seaside from the early days in the eighteenth century right up to the present day. The focus is mainly on the British seaside, but he also covers Europe and America. His account takes in most aspects of the look of the British coast. The seaside was made to appear more exotic and out of the ordinary. The architecture of the Brighton Pavilion is the natural example of this. He describes the rise of the pier in the Victorian era and the lido in the inter-war years. The look of the coastline includes the sea itself, the beach, sandcastles and windbreaks, even the humble British deckchair. He tells us that Blackpool Councils attempt to replace "cloth cap" deckchairs with more up-to-date plastic sun loungers ended in failure. Such was our affection for the image of the traditional British seaside. This book covers how resorts were presented, as well as the buildings. This includes the view presented by guide books and how commercial guides, with their objective and sometimes less than complimentary views, were eventually ousted by the "official" guide book with its often hopefully upmarket view of the seaside town concerned. The author takes us right up to the present day in his account of the development of the seaside. I found the section on the recent fiasco over the West Pier at Brighton particularly fascinating. I was a little frustrated though at the authors refusal to take sides. He adopted a similar refrain when discussing the fate of lidos or outdoor swimming pools. In not aligning himself with the "preservationists", he risks fuelling the ever growing threat of unsympathetic commercial exploitation of the British coastline. I also felt that the 50s and 60s were treated rather too briefly. There is little mention of architecture from this period at the seaside. 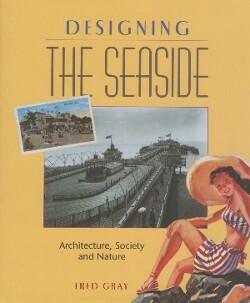 Overall, this book is a well argued account of all aspects of design and the seaside. It will be an excellent reference book, as well as an interesting read, for students of both tourism and architecture and design.